A few years ago, I decided to make it myself. I scoured the internet and was surprised at how simple it was to make! This is the recipe I use. In a quart jar, add the lemon peels and cover with your choice of alcohol. Place a lid on the jar and let sit on the counter for a minimum of 4 days. I prefer a stronger lemon taste, so mine sits for 30 days or longer. When ready, bring 3 1/2 cups water and 2 1/2 cups sugar to a boil over medium heat making sure all the sugar is dissolved. Remove from heat and let cool completely. 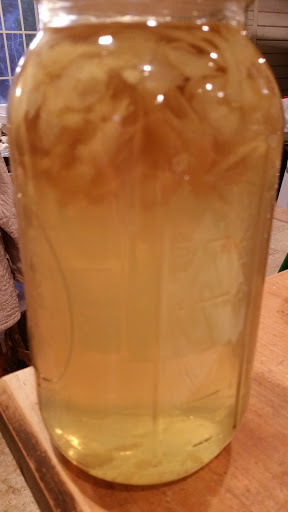 Transfer the lemon mixture to a half gallon jar, pour the cooled simple syrup over it and mix well. Replace the lid and let sit for 24 hours. After 24 hours, strain the mixture through a fine mesh sieve. Pour into your bottles or jars and refrigerate for 24 hours before serving. If you like, place the limoncello in a freezer proof bottle/jar and freeze before serving. Trust me, you really want to do this *insert smiley face*.